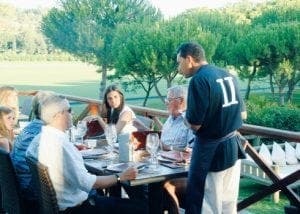 UNSURPRISING for an exclusive enclave like Sotogrande there are plenty of good places to eat. Starting in the port itself, you should check out the excellent Belgium-run La Terrasse, which straddles one whole corner with enticing frontline views of the boats. 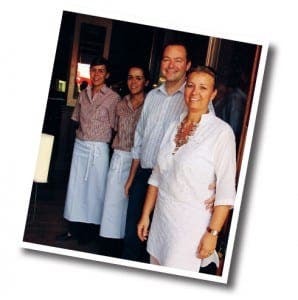 Run by Jessy and Anne Hoornaert – who both do their stints in the kitchen – it has a good mix of international and French-style cuisine. Either go for the main menu, which has some great dishes like tagliata of fillet steak, or try the new tapas menu, which can be taken in the new chill out area outside. The couple originally ran a beach restaurant in Duquesa called Babelu, before buying this prestigious spot, after a few years working in the Dominican Republic. Another wonderful place to dine, right by the water, is Spinnakers, owned by friendly couple Monica and Janus (John) from Budapest. An enterprising pair, the menu is very international with a great range of wines, but, best of all, they have a fabulous new cocktail bar, right by the water, which is really making waves. Nearby you must also look out for the well-established stalwart, the Hairy Lemon, which is fast becoming one of the top hangouts in the port. Serving fresh food by day, there is a good list of wines and over two dozen tapas created by chef Lorenc, who spent 14 years working in the restaurant trade in London. The best include home-made Scotch eggs with lemon mayonnaise and great mushrooms stuffed with goats cheese. If it is romance you are after, two places take some beating. The first is La Finca, up in Alcaidesa, which sits in a 200-year-old farmhouse that was once the nerve centre for one of the area’s biggest estates. Today, ancestor Syrie Blanco Walsh and husband Chris have turned it into an atmospheric escape, full of charm and creativity. The candlelit garden at the front is simply beautiful. The Thai fusion menu comes courtesy of Benny, an amiable Thai/American friend, who truly has the magic touch. His Summer roll, an incredibly fresh offering of shrimp, crab, egg and bean sprouts, as well as his spicy beef salad with classic ‘sticky’ rice really hit the spot. Second is the breathtakingly beautiful La Cancha II, a stylish terracotta wood eaterie, which sits in one of Europe’s most exclusive private polo grounds, the Ayala club. With a backdrop of oleander and pines and perfectly clipped lawns, it is the ideal escape for Europe’s wealthiest and most famous families. With recent diners including the Duchess of York, Spain’s top bullfighter El Juli and the Cartier family this is the place to star spot. The place prides itself on its quality meat, much from Argentina and it is cooked to a tee on a ‘parilla’ only using orange wood. For something more down to earth you should definitely look out for the pair of restaurants at San Roque Suites Hotel. The first is Tango’s, which is an informal grill style restaurant, which is popular in summer with its great outdoor terrace and various outdoor events. The second is the more sophisticated La Zingara, which is the brainchild of Biagio Carroccea, 31, one of Andalucia’s most passionate chefs, who also doubles as a magician. 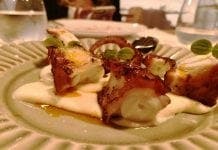 Described as Mediterranean ‘fusion food’, this is haute cuisine with a good mix of Italian, Spanish and local Andaluz. However some of his best dishes come from France or Galicia, where he worked as a chef for three years. Last, but not least, why not head up to nearby Casares village where you will find the authentic family-run restaurant Casa Curro (right). Everything is made from scratch and there are plenty of vegetables.